An energetic leader, teacher and visionary, Rebecca L. (Becky) Blue challenges her clients and coworkers to visualize the pertinent questions or problems, and then aids them in implementing the most effective solution. Becky has the ability to look beyond where they are today, listens to understand where they are going, and uses that vision to move them forward. Her successful history of working with clients has enabled her to provide solutions that extend across the enterprise, and to deliver results that are measured in time, money and improved levels of service. 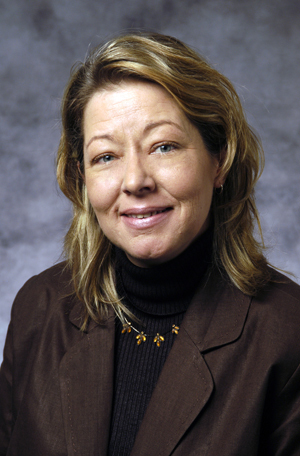 Becky has been active in the Minnesota GIS/LIS Consortium since 1995, serving on the Board as chair elect, chair and past chair, conference presenter, workshop presenter, sponsor, and exhibitor. She has served on the Minnesota Governor’s Council on Geographic Information and on the Emergency Management Committee. 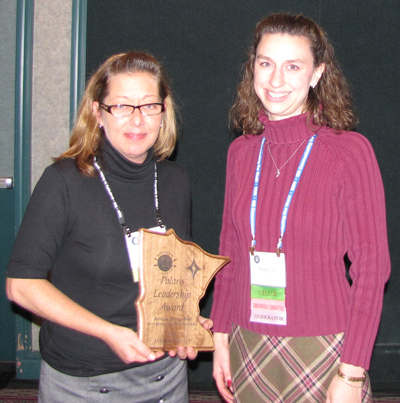 As a GIS professional she believes strongly in sharing her knowledge and expertise, which has led her to be an active presenter and member in many users groups including Anoka, Ramsey and Hennepin Counties, as well as helping implement a statewide users group for Cityworks (geocentric asset management solution). Becky exemplifies the core principles of the Polaris Leadership Award through her attitude, cheerful assistance, demonstrated leadership and contributions to her clients, colleagues and the consortium. 2009 Polaris Award recipient Rebecca Blue with 2009 Consortium Chair Rebecca Foster.